Bean Bag Chairs For Kids and Adults! A bean bag chair is essentially a large vinyl or leather sack filled with actual dried beans or, more commonly, synthetic polystyrene beads. The user places the bean bag chair in a chosen spot on the floor and centers his or her body over the bag before falling into it. The user's weight is supported by the beads and the outer shell basically forms around his or her body. The bag should continue to provide support as the user changes positions. This is the theory behind bean bag chairs, at least. A bean bag chair is often associated with dorm rooms and first apartments, primarily because of its low cost and appeal to younger furniture shoppers. A bean bag chair can be carried home in a standard car, and it can be handled easily by one person. This makes it appealing to students and young adults who need to supplement their home furniture for guests, but aren't as concerned about creating a formal look with standard furnishings. The informality of a typical bean bag chair, however, can also be viewed as its Achilles heel. Once a person has fully sunk into the bag, it can be notoriously difficult to float back out. Lumbar support is minimal with most bean bag chairs, and the natural or synthetic bean stuffing can become compressed and less accommodating over time. Any tear or rip in the outer vinyl or leather shell can cause the filling to spill out and render the chair virtually useless. The overall popularity of a bean bag chair tends to run in cycles. The original bean bag chairs were known as Saccos, and became very popular during the late 1960s with a variety of colors. Bean bag chairs were far less imposing than standard furniture, encouraging users to congregate organically instead of in regimented arrangements. Over the intervening years, bean bag chairs largely fell out of favor because of their poor lumbar support and stylistic limitations. A person might place a bean bag chair or two in a den or entertainment room, but it would be completely out of place in a formal living room. Bean bag chairs, much like light organs or lava lamps, became closely associated with a dated 1970s style. Improvement in bean bag chair technology, however, helped improve its appeal in the late 1990s. The outer shells could be removed and washed, while a waterproof inner lining protected the beads from damage and leakage. The material used for the outer shell was also improved to reduce the dreaded adhesion problem many former users had with the vinyl or leather outer shells. 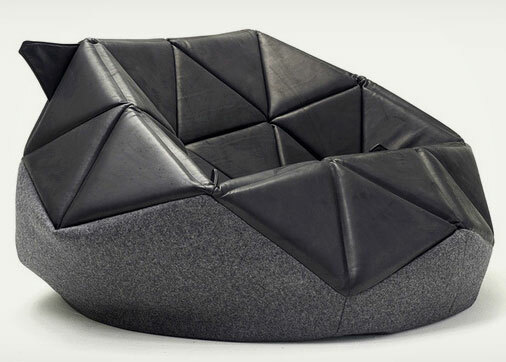 Modern bean bag chairs are largely marketed towards the same collegiate/young adult demographic as before. While bean bag chairs may never become as popular as they were during the 1960s and early 1970s, they can still be found in the home furnishing department of many major retail stores. A bean bag is simply a bag that is filled with beans or other similar materials and sealed similar to bean bag chairs. There are many different sizes and types of bean bags, and many different uses for them. While many of these uses of bean bags are for recreational purposes, there are also bean bags that are designed for more practical purposes. The material that a particular bean bag is constructed of will vary depending on its use. The outer "shell" can be made of fabric, leather, knitted material and more. Despite the name, bean bags are usually not actually filled with beans, or in some cases, dried peas or millet. Rather, they are usually filled with man made materials such as polystyrene beads or ground Styrofoam&trade. The most popular use of a bean bag is as a bean bag chair. This type of chair is usually made of leather or vinyl, but can also be made of nylon, cotton, polyester, or fur-like material. The nature of the bean bag chair allows it to contour to its user's back when he or she sits in it, but they are not necessarily very ergonomic. They became popular in the 1960s and still can be purchased at many stores today, and are usually marketed for children and young adults. Smaller versions of these can also be used as pillows. Even smaller versions of the bean bag are used for juggling and for learning this popular activity. They can easily be caught due to their malleability and weight. They also make a sound when they hit the juggling learner's hand, which is useful for developing the necessary rhythm to be able to juggle several items at once. Similar to juggling bean bags are foot bags, which are designed to be kicked instead of thrown. In the popular pastime of foot bagging, several people gather in a circle and must use any part of their body, except the hands, to keep the foot bag in the air while performing unique tricks in the process. There are also a few practical uses for bean bags. Small ones are popular for use in photography as a stand to rest the camera on for shots where it is easier than using a tripod. Bean bags are also often used as a weighted base to rest items such as cell phones or ashtrays, and can be very useful in a moving vehicle. There are even some weapons that fire bean bags as an alternative to deadly weapons for use in crowd control.